As low as $44.99 per coin over spot! The South African Gold Krugerrand coins from the South African and the Rand Refinery have been in production since 1967. Though the 1 oz gold coin has been offered every year since that time, the fractional weights weren’t introduced until 1980. Among those fractional options is the 1/4 oz gold coin. The 2019 1/4 oz South African Gold Krugerrand Coin is currently available to you online for purchase from JM Bullion. Coins available to you inside of protective packaging or in mint tubes of 50 coins! 53rd year of issue for the South African Gold Krugerrand coinage! Contains 1/4 Troy oz of actual gold content. Paul Kruger appears on the obverse of the coins. A Springbok antelope is featured on the reverse of coins. South African Gold Krugerrand coins feature .9167 pure gold content. Introduced in 1967, the Gold Krugerrand would come to dominate the gold bullion coin market courtesy of a bull market for gold in the 1970s. By 1980, the Gold Krugerrand’s 1 oz coin accounted for 90% of global gold bullion coin sales. On the back of this success, the South African Mint expanded the collection in that same year to include three fractional-weight coins. Those options include the 1/2 oz coin, these 1/4 oz coins, and a 1/10 oz coin. All of this occurred despite a Western boycott on South African good, including the Gold Krugerrand, stemming from the nation’s apartheid system. The obverse side of the 2019 South African Gold Krugerrand coins features a left-profile portrait of Paul Kruger. The first president of the South African Republic in the late 19th century, Kruger was a leading Boer figure who pushed back against British control of South Africa. Kruger was so beloved by the people that he was often referred to simply as Oom Paul, or Uncle Paul. 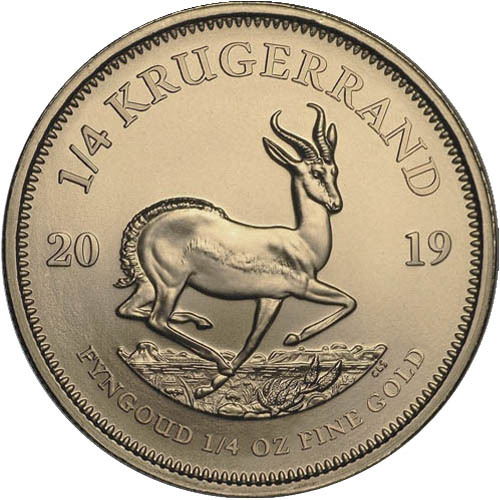 On the reverse of all 2019 1/4 oz South African Gold Krugerrand coins is the national symbol. The Springbok antelope is a species that is widely dispersed across southern Africa and is found in higher concentrations within South Africa. As such, the species is considered the national symbol. Both the Springbok antelope and effigy of Paul Kruger were modernized last in 1984. Coert Steynberg redesigned the reverse field and Otto Schultz created a modern depiction of Paul Kruger. South African Gold Krugerrand coins are issued by the South African Mint and the Rand Refinery. The mint is a privately-owned company responsible for the production of national currency and gold bullion coinage for the South African Reserve Bank. We encourage JM Bullion customers to call us with questions at 800-276-6508. You can also connect with our customer service team online using our live chat and email address features.